CMS releases MACRA rule proposal: Will HHS force physicians to drop fee for service for fee for outcome? The U.S. Department of Health and Human Services unveiled a proposed ruletackling the initial implementation of the Medicare Access and CHIP Reauthorization Act of 2015 (MACRA). The Merit-based Incentive Payment System (MIPS), which scores clinicians on four performance categories based on flexible measures and activities chosen by physicians based upon their specialty, a move that reportedly addresses concerns voiced in feedback from roughly 6,300 practitioners. Advanced Alternative Payment Models (APMs), including the Comprehensive Primary Care Plus and Next Generation ACO models, among others. The Centers for Medicare & Medicaid Services expects most providers to opt for the MIPS track initially, according to CMS Acting Principal Deputy Administrator and Chief Medical Officer Patrick Conway, M.D., who spoke on a conference call announcing the rule. Participation in Advanced Alternative Payment models would exempt doctors from MIPS reporting requirements while also qualifying them for financial bonuses in exchange for taking on the risks related with providing “coordinated, high-quality care,” according to CMS. The agency expects both the number of physicians participating in this track and the number of payment models available to grow over time. CMS also reports that doctors will have the flexibility to switch among various components of the Quality Payment Program as dictated by the needs of their patients or their practices. In this video, Gilberg, senior vice president for the Medical Group Management Association’s Government Affairs Office, discusses CMS’ Physician Value-based Payment Modifier. In 2015, Medicare will begin applying the modifier under the physician fee schedule to various providers to show value of care. “Cost and quality … make up the value equation, in the mind of the payer, in terms of Medicare,” said Gilberg. In addition to explaining how the modifier works, Gilberg also highlights other quality measures facing providers under the Physician Quality Reporting System and via the EHR Incentive Programs, better known as meaningful use. When the Medicare Access and CHIP Reauthorization Act (MACRA) legislation passed in April 2015, everyone cheered the repeal of the Sustainable Growth Rate (SGR) formula for Medicare physician payment. Now, even before the MACRA regulations are even promulgated, it’s time to pay attention because Medicare physician payments in 2019 will be impacted by their performance in 2017, just a year from now. The Affordable Care Act: A Considered Evaluation. The Implementation of the ACA, Impact on Physicians and Patients, and the Dis-Ease of the Accountable Care Organizations. The Affordable Care Act: A Considered Evaluation. Part II: The Implementation of the ACA, Impact on Physicians and Patients, and the Dis-Ease of the Accountable Care Organizations. There are inherent problems at looking at this from a systems point of view, mainly impacted by the relationship of providers to hospitals and clinics, and by the relationships of insurers to the patients and providers in an Accountable Care Organization (ACO) model. These relationships have been evolving for many decades, first with the increased availability of highly skilled medical specialists trained in numerous university-based programs funded by Training Grants from the National Institutes of Health, then a high concentration of these skilled physicians in metropolitan locations, where there was an adequate patient-base for developing groups of refering physicians. Prior to WWII, there were many Asian physicians receiving their postgraduate training in the U.K. The number of foreign graduates coming to the U.S. Increased enormously with the opportunities that opened up in U.S. The first change in medical education that created a science-based professional came after the Flexner Report in 1910, sponsored by the Carnegie Endowment. 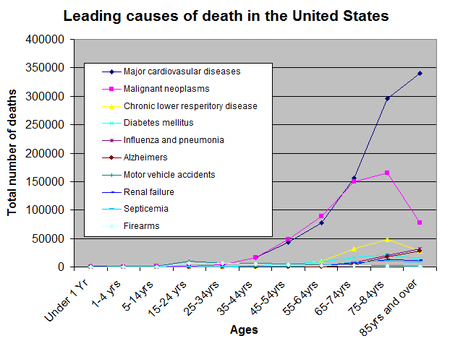 Many aspects of the present-day American medical profession stem from the Flexner Report and its aftermath.The Report (also called Carnegie Foundation Bulletin Number Four) called on American medical schools to enact higher admission and graduation standards, and to adhere strictly to the protocols of mainstream science in their teaching and research. Joseph Goldberger discovered the cause of pellagra in 1916. When the 1918 influenza pandemic struck Washington, physicians from the then PHS laboratory were pressed into service treating patients in the District of Columbia because so many local doctors fell ill. 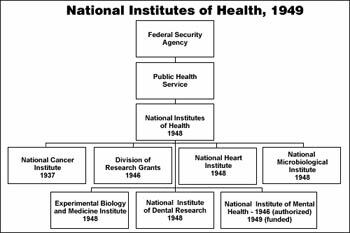 In 1930, the Ransdell Act changed the name of the Hygienic Laboratory to National Institute (singular) of Health (NIH) and authorized the establishment of fellowships for research into basic biological and medical problems. 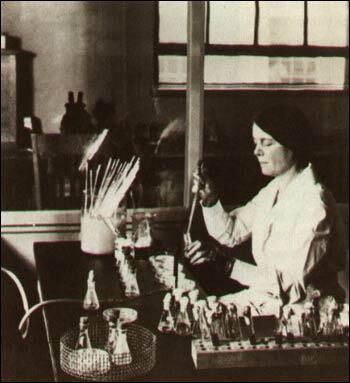 The roots of this act extended to 1918, when chemists who had worked with the Chemical Warfare Service in World War I sought to establish an institute in the private sector to apply fundamental knowledge in chemistry to problems of medicine. In 1926, after no philanthropic patron could be found to endow such an institute, the proponents joined with Louisiana Senator Joseph E. Ransdell to seek federal sponsorship. The truncated form in which the bill was finally enacted in 1930 reflected the harsh economic realities imposed by the Great Depression. Nonetheless, this legislation marked a change in the attitude of the U.S. scientific community toward public funding of medical research. Vaccines and therapies to deal with tropical diseases were also critically important to the WWII war effort by the PHS. At the NIH’s Rocky Mountain Laboratory in Hamilton, Montana, yellow fever and typhus vaccines were prepared for military forces. In Bethesda as well as through grants to investigators at universities a synthetic substitute for quinine was sought to treat malaria. Research in the Division of Chemotherapy revealed that sodium deficiency was the critical element leading to death after burns or traumatic shock. This led to the widespread use of oral saline therapy as a first-aid measure on the battlefield. NIH and military physiologists collaborated on research into problems related to high altitude flying. As the war drew to a close, PHS officials guided through Congress the 1944 Public Health Service Act, which defined the shape of medical research in the post-war world. Two provisions in particular had an impact on the NIH. First, in 1946 the successful grants program of the NCI was expanded to the entire NIH. From just over $4 million in 1947, the program grew to more than $100 million in 1957 and to $1 billion in 1974. The entire NIH budget expanded from $8 million in 1947 to more than $1 billion in 1966. Between 1955 and 1968. In this period, there was expansion of the NIH extramural budget, as well, and the grants dispursed were in support of developing the medical faculty of the future. It has nothing to do with then organization of the practice of medicine, but it has contributed much to the widespread quality of american medical education. As the cost of healthcare was increasing, mainly after the Korean and Vietnam War periods, there was a medically initiated concept of a National not-for-profit health maintenance organization (HMO), which would be modeled after the likes of Mayo Clinic, Cleveland Clinic, the Kaiser Permanente Plan, and Geisinger. But the insurance industry was already mature, and the hospitals were closely tied to Aetna, CIGNA, and Blue Cross Blue Shields, which had the actuarial pieces needed. Then an HMO industry emerged with a for-profit motive. As the U.S. Became enmesshed in two military engagements in Iraq and Afganistan for a full decade, there was a fierce competition between the need to support military requirements and the need to support the welfare of the community, with brilliant accelerated achievements that brought the Human Genome Project to a successful conclusion in 2003, and from that emerged advances in both clinical laboratory diagnostics and imaging, and which portends to continuing significant advances in treatments in cardiology, surgery, endocrinology, and cancer. In order to succeed, there has been a redesign or rearrangement of how these services are delivered, with a business model intended to – in time – bring down costs, and to also improve quality. Ironically, there is an insufficiency of primary care physicians, even considering internal medicine, pediatrics, obstetrics, and general surgery, as well as osteopathic physicians. Jonathan Oberlander, Ph.D., and Marisa Morrison, B.A. The Affordable Care Act (ACA) established the IPAB as a 15-member, nonelected board. Among other duties, the IPAB is empowered to recommend changes to Medicare if projected per-beneficiary spending growth exceeds specified targets. If Congress does not enact legislation containing those proposals or alternative policies that achieve the same savings, the IPAB’s recommendations are to be implemented by the secretary of health and human services. President Obama has proposed strengthening the board’s role by lowering the Medicare spending targets that would trigger IPAB action. Because the board is prohibited by law from making recommendations that raise revenues, increase cost sharing of Medicare beneficiaries, or restrict benefits and eligibility, it is expected to focus on savings from medical providers. In January 2013, the GOP adopted a House rule declaring that the IPAB “shall not apply” in the current Congress, thereby rejecting the special procedures that the ACA had established for congressional consideration of IPAB recommendations. On April 30, the chief actuary of the Centers for Medicare and Medicaid Services released a report projecting Medicare spending growth during 2011–2015. According to the report, per-person Medicare spending will grow at an average rate of 1.15% during that period, far below the target growth rate set by the ACA — the average of the Consumer Price Index (CPI) and the Medical CPI (see graph). Projected Growth in Medicare Per Capita Spending, the Consumer Price Index (CPI), and the Medical CPI, 2011–2015. The rate of increase in Medicare expenditures per enrollee has slowed since 2006, and because Medicare spending growth has moderated, the IPAB will be irrelevant to cost containment. 3 years after the ACA’s enactment, the IPAB still has no members. If no members are appointed, the power to recommend changes to Medicare when spending targets are exceeded does not disappear: it reverts to the secretary of health and human services. The board’s appeal lies largely in its aspiration to remove politics from Medicare — to create a policymaking process that is informed by experts and insulated from pressures outside their professional overview. If Medicare spending growth accelerates, the IPAB’s role could expand. But that future is uncertain. stand unaltered despite the Court-ordered switch in the basis for constitutional legitimacy from the Commerce Clause to Congress’s taxing authority. One consequential outcome of the ruling is the continuing benefit, and harm averted, for millions of Americans from ACA provisions that have already been implemented. Those benefiting include more than 6 million young adults enrolled in their parents’ insurance plans, 5.2 million Medicare enrollees who have saved on prescription-drug costs because of the shrinking Part D “doughnut hole,” 600,000 new adult Medicaid enrollees in seven states that have already expanded Medicaid eligibility, 12.8 million consumers who will receive more than $1 billion in insurance-premium rebates, and many others. Also undisturbed are the ACA’s numerous system reforms, such as accountable care organizations, patient-centered medical homes, the Prevention and Public Health Fund, and the Patient-Centered Outcomes Research Institute. Since the ACA’s passage, health system innovation has surged — a dynamic that would have been undermined by a negative Court ruling. 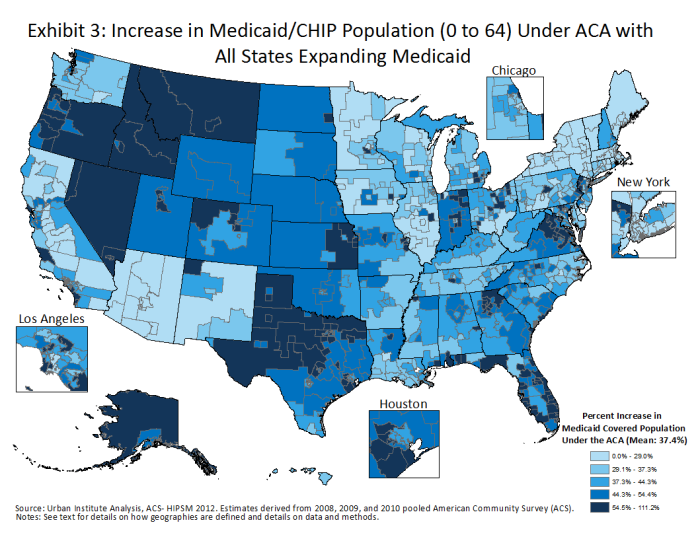 The biggest change involves Medicaid. 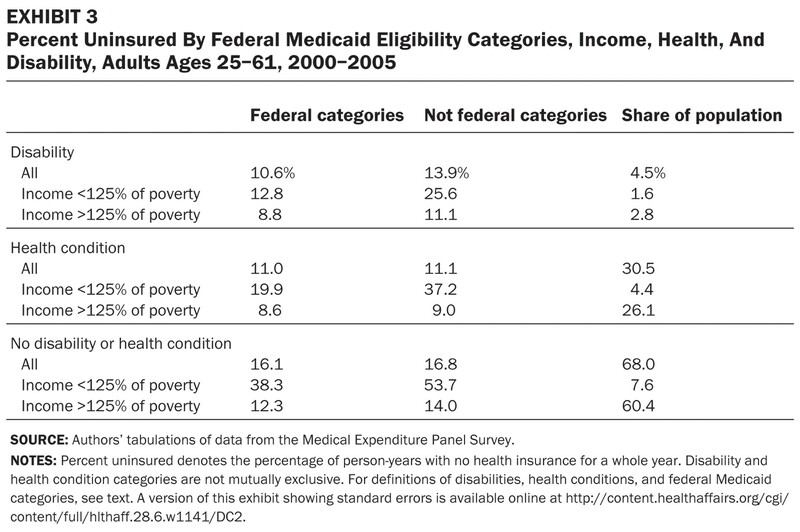 The ACA required that Medicaid serve nearly all legal residents with incomes below 138% of the federal poverty level. 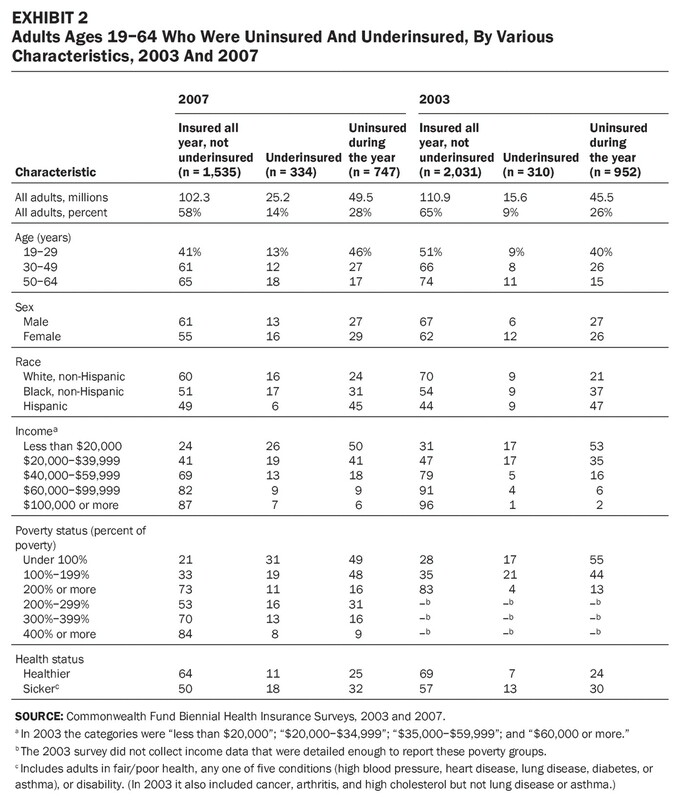 As a result, there is a new inequity in the health system: by 2014, all Americans will have guaranteed access to affordable health insurance except adults with incomes below the poverty level who were previously ineligible for Medicaid (those with incomes between 100 and 138% of the poverty level will be allowed to obtain coverage through insurance exchanges). States have strong economic incentives to expand Medicaid, since the federal government will pay 100% of expansion costs between 2014 and 2016. By 2020, the federal share will drop to no less than 90% — much more generous than the 50 to 83% that the federal government contributes for traditional Medicaid and the Children’s Health Insurance Plan. The current implementation queue includes writing definitions and rules for private health insurance markets, clarifying rules for determining required “essential health benefits,” explaining how employer-responsibility provisions will be devised, and much more. The ACA is the first U.S. law to attempt comprehensive reform touching nearly every aspect of our health system. The law addresses far more than coverage, including health system quality and efficiency, prevention and wellness, the health care workforce, fraud and abuse, long-term care, biopharmaceuticals, elder abuse and neglect, the Indian Health Service, and other matters. Encouraging competition among health plans, even if one of them is “public,” will also fail to solve the cost problem. With the exception of highly integrated organizations, such as Kaiser Permanente, health plans have only two tools to control costs: financial disincentives for patients and fee reductions for providers. 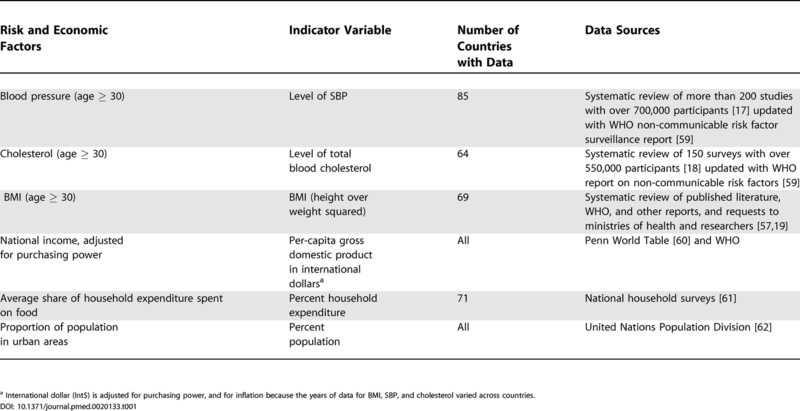 Acceptable out-of-pocket maximums, however, vitiate economic incentives to restrain use, particularly for expensive care such as inpatient care. Unable to alter provider behavior, health plans primarily try to avoid enrolling people who are likely to need costly care. In August 2011, in an agreement to raise the nation’s debt ceiling, bipartisan majorities in the House and Senate approved the Budget Control Act of 2011 (BCA) to reduce the deficit by $1.2 trillion between 2013 and 2021. The BCA established a threat of across-the-board cuts, or “sequestration,” if the Joint Select Committee on Deficit Reduction failed to approve, and Congress to enact, alternative reductions. Sequestration became operational on March 1. Of the $1.2 trillion in cuts, $216 billion will be reductions in debt-service payments, and the remaining $984 billion will be split evenly over 9 years at $109 billion per year, and further adjusted and split evenly between cuts to national defense and nondefense functions at $42.667 billion each. The $42.667 billion per year in nondefense cuts will not fall equally on all health-related government programs. Nonexempt and nondefense discretionary funding faces reductions of 7.6 to 8.2% in this fiscal year; certain programs such as Medicare and community health centers will have 2% reductions; and certain programs such as Medicaid and the Veterans Health Administration are exempt. Impact of Budget Sequestration on Key Federal Health and Safety Programs, Fiscal Year 2013. Medicare funding will be cut by 2% ($11.08 billion) through reductions in payments to hospitals, physicians, and other health care providers, as well as insurers participating in Medicare Advantage (Part C). The BCA prohibits cuts affecting premiums for Medicare Parts B and D, cost sharing, Part D subsidies, and Part A trust-fund revenues. The sequestration cuts arrive just as Medicare is beginning to fully implement the savings and cuts required by the Affordable Care Act (ACA), which the Congressional Budget Office estimates will slow Medicare’s rate of growth by $716 billion between 2013 and 2022. The National Institutes of Health (NIH) faces an 8.2% across-the-board reduction for the 7 months remaining in fiscal 2013, equaling cuts of $1.55 billion. The Centers for Disease Control and Prevention (CDC), which is still recovering from major budget reductions in 2011, anticipates effective reductions of 8 to 10% for the remainder of the year. The American Public Health Association has projected that the reductions could result in 424,000 fewer HIV tests (the CDC funded 3.26 million in 2010) and 50,000 fewer immunizations for adults and children (from a baseline of about 300 million), elimination of tuberculosis programs in 11 states, and shutting down of the National Healthcare Safety Network. Unaffected for all 9 years of the sequester are most expenses associated with the ACA. Medicaid is exempt, as is funding for its expansion, beginning next January, to all lower-income Americans in states that choose to participate. Also exempt are private insurance subsidies that will be available next January through new health insurance exchanges, because they were designed as refundable tax credits, another BCA-exempt category. Finally, the Children’s Health Insurance Plan, the Supplemental Nutrition Assistance Program, Temporary Assistance to Needy Families, and Supplemental Security Income are all exempt. the Supreme Court decision to permit states to opt out of such expansion altogether. Considerable evidence shows its effectiveness: most recently, a study by Sommers et al. documented its positive effects on health and health care. Experts in Medicaid spending also acknowledge the program’s operational efficiencies, achieved by states through the aggressive use of managed care and strict controls on spending for long-term care. Much of the health care that Medicaid beneficiaries receive is furnished through safety-net providers such as community health centers, which are highly efficient and accustomed to operating on tight budgets with only limited access to costly specialty care. Furthermore, Medicaid’s physician payments are substantially lower than those from commercial insurers and Medicare — a disparity that unfortunately limits provider participation even as it helps to keep per capita spending low. Indeed, the CBO has found that insuring the poor through Medicaid will cost 50% less per capita than doing so through tax-subsidized private insurance plans offered through state health insurance exchanges. The essential task is to thread the needle by accelerating efficiency reforms in health care payment and organization that, in turn, can generate savings over time while not damaging Medicaid’s role as a pillar of health care reform. Of particular importance is a heightened focus, begun under the ACA, on reforms that emphasize community care for millions of severely disabled children and adults, including patients who are dually enrolled in Medicare and Medicaid and who rely heavily on long-term institutional care. U.S. health care suffers from three major problems: millions of people go without insurance, health care costs are rising at unaffordable rates, and the quality of care is not what it should be. The Affordable Care Act (ACA) primarily addresses the first — and easiest — of these problems by expanding coverage to a substantial number of the uninsured. Solutions to the other two remain aspirations. 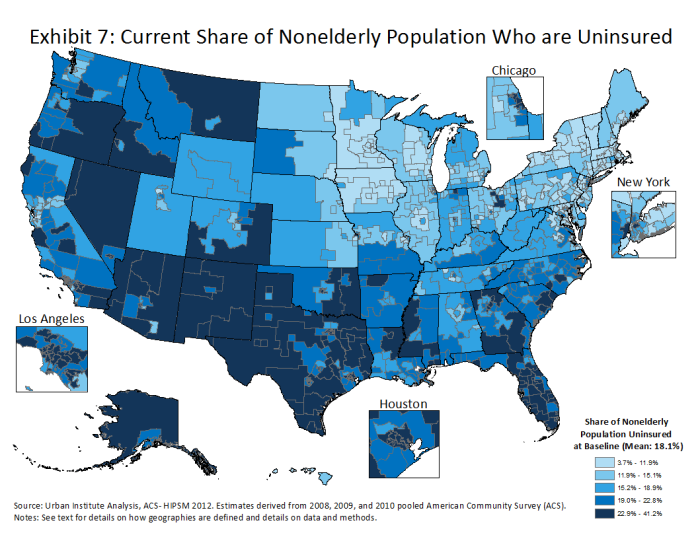 The ACA’s primary accomplishment is that approximately 30 million previously uninsured people may end up with coverage — about half with subsidized private coverage purchased in the mostly yet-to-be-formed state insurance exchanges and the other half through Medicaid expansions. The law’s most controversial provision remains the individual mandate, which requires people either to have insurance coverage or to pay a penalty. 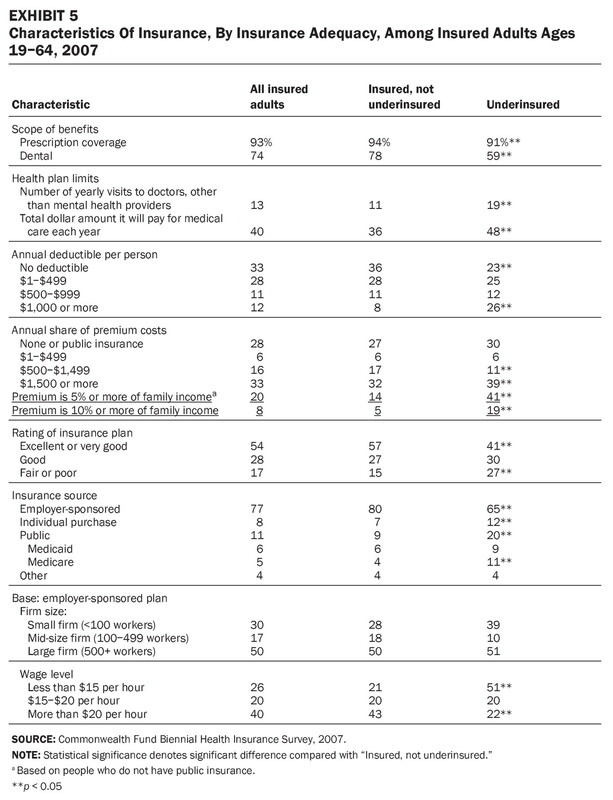 The penalty for not having insurance is very small, particularly for younger people with modest incomes. It would have been smarter to mimic Medicare’s policies: seniors who don’t purchase the voluntary parts of Medicare covering physician services and outpatient prescription drugs during the first year in which they lack comparable coverage must pay a penalty for every month they have gone without coverage whenever they finally do purchase it. Despite widespread recognition that fee-for-service reimbursement rewards providers for the quantity and complexity of services and encourages fragmentation in care delivery, the ACA retains all the predominantly fee-for-service reimbursement strategies currently used in Medicare. Much of the coverage expansion is financed through Medicare budget savings, which are produced by reducing the fees paid by Medicare to institutional providers such as hospitals, home care agencies, and nursing homes — but using the same perverse reimbursement system currently in place. Reducing payments to institutional providers should not be confused with lowering the cost of providing care. Most troubling, the ACA contains no reform of the way physicians are paid, which is the most dysfunctional part of the Medicare program. Through the Resource-Based Relative Value Scale, physicians are reimbursed on the basis of service codes, and payment for each physician service is reduced whenever aggregate spending on physician services exceeds a prespecified limit. This system disregards whether clinicians are providing low-cost, high-value care for patients. Given physicians’ key role in providing patient care, it’s impossible to imagine a reformed delivery system without one that rewards them for providing clinically appropriate care efficiently. What is needed are reforms that create clear financial incentives that promote value over volume, with active engagement by both consumers and the health care sector. Market-friendly reforms require empowering individuals, armed with good information and nondistorting subsidies, to choose the type of Medicare delivery system they want. Being market-friendly means allowing seniors to buy more expensive plans if they wish, by paying the extra cost out of pocket, or to buy coverage in health plans with more tightly structured delivery systems at lower prices if that’s what suits them. Disparate voices from the White House, a national fiscal commission, Congress, a Medicare advisory body, private foundations, and academic medical leaders are advocating changes to Medicare’s investment in graduate medical education (GME), which currently totals $9.5 billion annually. They offer various prescriptions, including reducing federal support, developing new achievement measures for which GME programs should be held accountable, and seeking independent assessment of the governance and financing of training programs. The influential GME community has withstood most past efforts to change Medicare’s GME policies. But recognizing today’s more challenging political environment, the Association of American Medical Colleges (AAMC) has begun discussing alternative methods of financing GME that could better align training with the future health care delivery system and address U.S. workforce needs. The association is also examining the influence of student debt on the enrollment of a diverse student body. When Congress enacted Medicare in 1965, it assigned to the program functions that reached well beyond its mission of financing health care for the elderly. One function was supporting GME, at least until the society at large undertook “to bear such education costs in some other way.” Almost 50 years later, Medicare remains the largest supporter of GME, providing both direct payments to hospitals that cover medical education expenses related to the care of Medicare patients (about $3 billion per year) and an indirect medical education (IME) adjustment to teaching hospitals for the added patient-care costs associated with training (about $6.5 billion). In its 2013 budget, unveiled on February 13, 2012, the Obama administration proposed reducing Medicare’s IME adjustment by $9.7 billion over 10 years, beginning in 2014, citing a report from the Medicare Payment Advisory Commission (MedPAC) indicating that Medicare’s IME adjustments “significantly exceed the actual added patient care costs these hospitals incur.” The administration also proposed that the secretary of health and human services be granted the authority to assess GME programs’ performance in instilling in residents the necessary skills to promote high-quality health care. Similarly, MedPAC had recommended redirecting about half the IME adjustments ($3.5 billion) into “incentive payments” that GME programs could earn by meeting performance standards. The Obama budget would also eliminate coverage of the IME expenses of free-standing children’s hospitals with pediatric residency programs — which do not treat Medicare patients — reducing their federal support by 66% (to $88 million). Moreover, Congress has revealed its uncertainty over how to change federal workforce policy. In the Affordable Care Act (ACA), Congress emphasized the importance of expanding the primary care workforce. But legislators rejected the AAMC’s call to expand the number of Medicare-funded GME positions by 15% in response to reported physician shortages in some specialties. The priorities cited in the IOM letter parallel some of the recommendations of a group of academic medical leaders who gathered at two conferences underwritten by the Josiah Macy Jr. Foundation. At the first conference, in October 2010, the top recommendation was that “an independent external review of the goals, governance, and financing of the GME system should be undertaken by the Institute of Medicine, or a similar body.”3 George Thibault, president of the Macy Foundation, says the group concluded that “because GME is a public good and is significantly financed with public dollars, the GME system must be accountable to the needs of the public.” Acknowledging that some people in academic medicine “favor a behind-the-scenes discussion of GME reform alternatives,” Thibault noted, “I believe we should be upfront, providing examples of change that could influence the thinking of policymakers.” The foundation awarded the IOM $750,000 — about half the support it needs for the GME study. Elliott S. Fisher, M.D., M.P.H., Donald M. Berwick, M.D., M.P.P., and Karen Davis, Ph.D. The recent commitment by several major stakeholders — including the American Medical Association — to slowing the growth of health care spending is a promising development. But the controversy about whether the organizations actually agreed to a 1.5-percentage-point reduction in annual spending growth is just one indication that success is still far from assured. Two threats in particular put reform at risk: conflicting doctrines (regarding the creation of a new public insurance option and government support for comparative-effectiveness studies) and opposition to change among some current stakeholders. In the face of this uncertainty, physicians have a choice: to wait and see what happens or to lead the change our country needs. We’d prefer the latter. The first level is aims. For health care reform, we propose that physicians, through their advocacy, help lead the country to embrace the so-called triple aim: better experience of care (safe, effective, patient-centered, timely, efficient, and equitable), better health for the population, and lower total per capita costs. The second level is the design of the care processes that affect the patient — clinical “microsystems.” Health care microsystems are famously unreliable, variable in costs, and often unsafe. Physicians, through their participation in quality-improvement initiatives in their practices and hospitals, can and should lead the needed changes in the systems of care in which they work, to make them safer, more reliable, more patient-centered, and more affordable. However, neither physicians nor anyone else on the front lines can improve care much on their own. Their most important source of support for improvement is the third level described by the IOM — the health care organizations that house almost all clinical microsystems and can ensure coordination among them. We need organizations large enough to be accountable for the full continuum of patients’ care as well as for achieving the triple aim. We will create a high-performing health care system only if integrated delivery systems become the mainstay of organizational design. 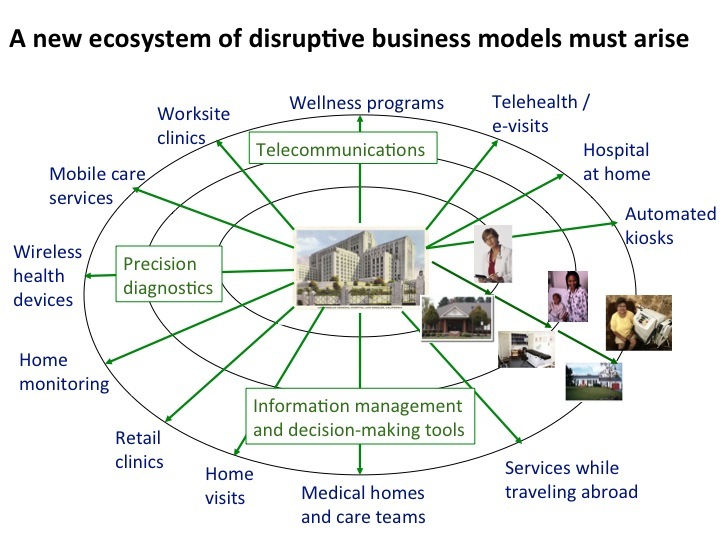 Organizations could be virtually integrated, such as networks of independent physicians sharing electronic health records and administrative and clinical support for care management and quality improvement, or structurally integrated, such as multispecialty group practices or staff-model health maintenance organizations. Fostering the development of such accountable care organizations need not be disruptive to patients or providers: almost all physicians already work within natural referral networks that provide the vast majority of care to patients seen by the primary care physicians within the network. The IOM’s fourth level is the environment, which includes the payment, regulatory, legal, and educational systems. On this front, too, we need physician advocacy. The United States cannot achieve the triple aim without health insurance for everyone. Integrated delivery systems that are accountable for populations won’t thrive unless payment systems encourage their development and unless we change the laws and regulations — including proscriptions of gainsharing and anti-kickback rules — that prevent cooperation among health care professionals and organizations. If stakeholders can agree on such a vision of health care reform, perhaps we could shift our focus from the conflict over whether a new public plan should be created to a more constructive insistence that all health plans, whether public or private, focus on the development of professionally led, integrated systems. If health care providers and suppliers could actually achieve this reduction in growth rates, the federal government would harvest about $1.1 trillion in savings over the 11-year period — enough, perhaps, to close the deal on affordable health insurance for all. Others would also see savings: $497 billion for employers, $529 billion for state and local governments, and $671 billion for households. One simple way for physicians to start contributing to this goal is by reassessing and scaling back, where appropriate, their use of clinical practices now listed as “overused” by the National Quality Forum’s National Priorities Partnership. Editor’s Note: On the eve of the first anniversary of the Supreme Court’s ruling to uphold most provisions of the Affordable Care Act (ACA), Medscape Editor-in-Chief Eric J. Topol, MD, questioned Secretary of Health and Human Services (HHS) Kathleen Sebelius about the act’s effect on medical technology, clinical trial participation, genetic testing, primary care, and patient safety. Dr. Topol: We are experiencing a digital revolution in which technological advances are putting healthcare where it should be: in the hands of patients. How is the ACA helping to foster medical innovation? Secretary Sebelius: A recent New York Times column, “Obamacare’s Other Surprise,” by Thomas L. Friedman, echoes what we’ve been hearing from healthcare providers and innovators: Data that support medical decision-making and collaboration, dovetailing with new tools in the Affordable Care Act, are spurring the innovation necessary to deliver improved healthcare for more people at affordable prices. Today we are focused on driving a smarter healthcare system with an emphasis on the quality — not quantity — of care. The healthcare law includes many tools to increase transparency, avoid costly mistakes and hospital readmissions, keep patients healthy, and test new payment and care delivery models, like Accountable Care Organizations (ACOs). Health information technology is a critical underpinning to this larger strategy. In May we reached an important milestone in the adoption of health information technology. More than half of all doctors and other eligible providers, and nearly 80% of hospitals, are using electronic health records (EHRs) to improve care, an increase of at least 200% since 2008. Also in May, we announced a $1 billion challenge to help jump-start innovative projects that test creative ways to deliver high-quality medical care and lower costs to people enrolled in Medicare and Medicaid, following 81 Health Care Innovation Awards that HHS awarded last year. Dr. Topol: Physicians have long lamented the lack of participation by patients in clinical trials, but the ACA is opening the door for greater participation by allowing patients to keep their health insurance while participating in clinical research. Are patients even aware that this provision now exists? How do you see it affecting clinical trial participation in the future? Secretary Sebelius: In 2014, thanks to the ACA, insurance companies will no longer be able to deny patients from participating in an approved clinical trial for treatment of cancer or another life-threatening disease or condition, nor can they deny or limit the coverage of routine patient costs for items or services in connection with trial participation. For many patients, access to cutting-edge medicine available through clinical trials can increase their likelihood of survival. This is an important protection for patients that not only could have a life-altering impact, but it’s also one that serves to facilitate participation in research that is critical to expanding our knowledge base and finding cures and treatments for those illnesses that threaten the lives of Americans each day. Dr. Topol: One of the intentions of the ACA is to increase the primary care workforce. This is critical as we approach 2014, when more Americans than ever will have either private insurance or Medicaid. Have you seen any movement in the primary care workforce? Are there concerns that there aren’t enough clinicians available to meet the forthcoming patient load? Secretary Sebelius: Primary care providers are critical to ensuring better coordinated care and better health outcomes for all Americans. To meet the health needs of Americans, the Obama Administration has made the recruitment, training, and retention of primary care professionals a top priority. Creating primary care payment incentives for providers; and Redistributing unused residency positions and directing those slots for the training of primary care physicians. Additionally, the ACA is modernizing the primary care training infrastructure, creating new primary care clinical training opportunities, supporting primary care practice, and improving payment and financial incentives for coordinated care. Dr. Topol: George Orwell once said that the hospital is the antechamber to the tomb. That was written decades ago, and unfortunately there’s still truth to that today. One in 4 hospital patients in America have a problem with medical mistakes, contract hospital-acquired infections, and experience medication errors. The ACA last year began linking Medicare payments to quality of patient care, offering financial incentives to hospitals that improve patient care. How is this working? Have there been any meaningful care improvements over the past year? Secretary Sebelius: The ACA includes steps to improve the quality of healthcare and, in so doing, lowers costs for taxpayers and patients. This means avoiding costly mistakes and readmissions, keeping patients healthy, rewarding quality instead of quantity, and creating the health information technology infrastructure that enables new payment and delivery models to work. These reforms and investments will build a healthcare system that will ensure quality care for generations to come. 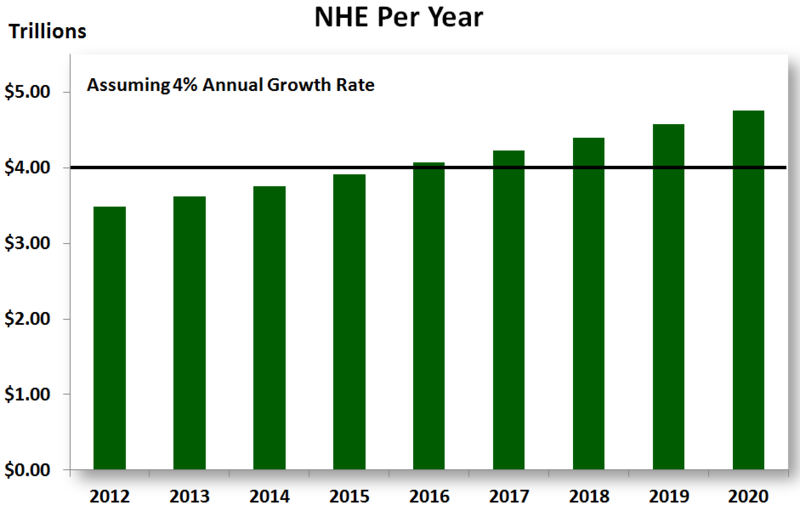 Secretary Sebelius: Medicare spending per beneficiary grew just 0.4% per capita in fiscal year 2012, continuing the pattern of very low growth in 2010 and 2011. Medicaid spending per beneficiary also decreased 0.9% in 2011, compared with 0.6% growth in 2010. 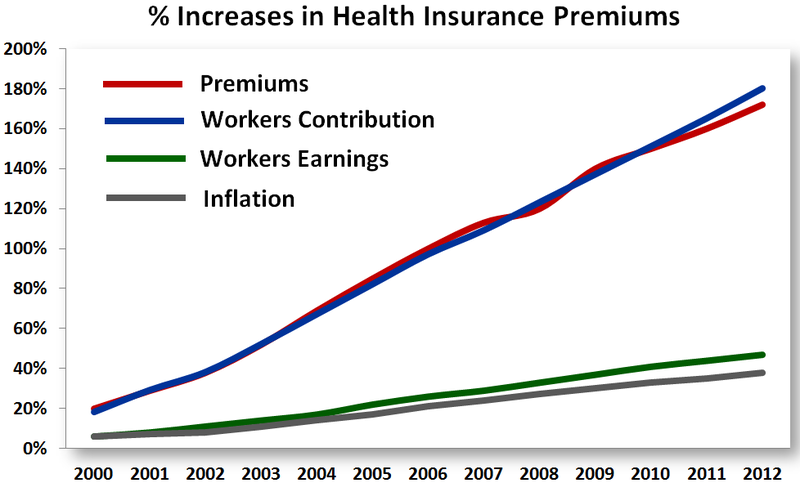 Average annual increases in family premiums for employer-sponsored insurance were 6.2% from 2004 to 2008, 5.6% from 2009 to 2012, and 4.5% in 2012 alone. Secretary Sebelius: Several programs tie Medicare reimbursement for hospitals to their readmission rates, when patients have to come back into the hospital within 30 days of being discharged. Additionally, as part of a new ACA initiative, clinicians at some hospitals have reduced their early elective deliveries to close to zero, meaning fewer at-risk newborns and fewer admissions to the NICU. Secretary Sebelius: In 2012, we debuted the Medicare Shared Savings Program and the Pioneer Accountable Care Organization Model. These programs encourage providers to invest in redesigning care for higher-quality and more efficient service delivery, without restricting patients’ freedom to go to the Medicare provider of their choice. Over 250 organizations are participating in Medicare ACOs, serving approximately 4 million, or 8%, of Medicare beneficiaries. As existing ACOs choose to add providers and as more organizations join the program, participation in ACOs is expected to grow. ACOs are estimated to save up to $940 million in the first 4 years. A Medicare payment approach in which savings and risk are shared may achieve a better balance of cost, quality, and access than a system of single bundled payments, at least until our capacity to measure patients’ care needs and outcomes is sufficiently robust. The Affordable Care Act federal and state officials are working with leaders in the health and insurance industries to restructure our nation’s healthcare system. That restructuring means most Americans will be required to have health insurance and most businesses will be required to offer it to their employees. It also means the creation of another kind of insurance plan called a health insurance exchange. 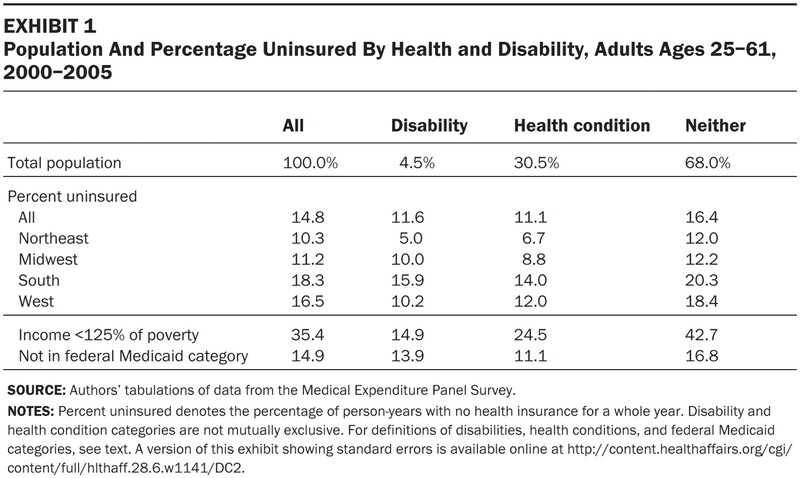 The government will require most Americans to have health insurance by 2014. The government has enacted this provision as a way to get healthy people who don’t feel the need to pay for coverage to buy insurance. That way, the healthy people can help fund the cost of people who require more medical care. Several states filed, and lost, a suit against the federal government saying that it is unconstitutional to make individual citizens to buy health insurance. Have been uninsured for less than three months. If you’re penalized, the amount you’ll be fined will go up each year for the first three years. In 2014, you’ll pay $95 or 1 percent of your taxable income, whichever is greater. In 2015, the fine will be $325 or 2 percent of taxable income, and in 2016 the penalty will be $695 or 2.5 percent of income. Each year after 2016, the government will refigure the fine based on a cost-of-living adjustment. To help you meet the cost of mandated insurance, the government will offer premium credits and cost sharing subsidies if you and your family meet certain income guidelines and if you enroll in one of the new state-run insurance exchanges. If your income falls between 133 and 400 percent of the federal poverty level (FPL), you could receive premium credits that will lower the maximum amount of premium you have to pay for your coverage. There will be a catastrophic plan for people under 30 and for those who are exempt from mandated coverage. States don’t have to set up the exchanges. If a state chooses not to, the federal government can come in and create them. States that do opt for exchanges will decide whether they’ll be run by a government or not-for-profit entity. 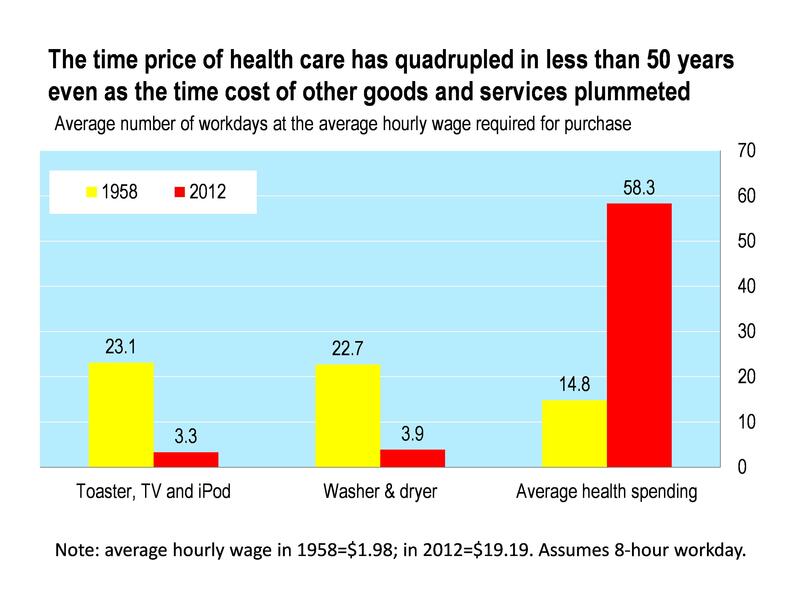 Health Care Reform — Why So Much Talk and So Little Action? First, many organizations and individuals prefer the status quo. This category includes health insurance companies; manufacturers of drugs, medical devices, and medical equipment; companies that employ mostly young, healthy workers and therefore have lower health care costs than they would if required to help subsidize care for the poor and the sick; high-income employees, whose health insurance is heavily subsidized through a tax exemption for the portion of their compensation spent on health insurance; business leaders and others who are ideologically opposed to a larger role of government; highly paid physicians in some surgical and medical specialties; and workers who mistakenly believe that their employment-based insurance is a gift from their employer rather than an offset to their potential take-home pay. Third, our country’s political system renders Machiavelli’s Law of Reform particularly relevant in the United States, where many potential “choke points” offer opportunities to stifle change. The problem starts in the primary elections in so-called safe congressional districts, where special-interest money can exert a great deal of influence because of low voter turnout. The fact that Congress has two houses increases the difficulty of passing complex legislation, especially when several committees may claim jurisdiction over portions of a bill. Also, a supermajority of 60% may be needed to force a vote in the filibuster-prone Senate. Fourth, reformers have failed to unite behind a single approach. Disagreement among reformers has been a major obstacle to substantial reform since early in the last century. According to historian Daniel Hirshfield, “Some saw health insurance primarily as an educational and public health measure, while others argued that it was an economic device to precipitate a needed reorganization of medical practice. . . . Some saw it as a device to save money for all concerned, while others felt sure that it would increase expenditures significantly.” These differences in objectives persist to this day. Health insurers are opening stores alongside department stores, other typical mall tenants. ,The new health law known as the Affordable Care Act means most uninsured Americans are required to have insurance beginning March 31 or pay a penalty at tax time in 2015. Insurers need to sign up as many healthy, younger people as they can to pay for all of the older, sick customers they will be taking on. The law prohibits insurers from denying people insurance because of pre-existing health problems and limits how much more they can charge older than younger people. So, for the first time, insurers are fiercely competing to attract individual consumers and turning to traditional retail marketing techniques to do so, luring them into stores with special events and using splashy advertising. As any retailer knows, they have the greatest chance of converting shoppers to customers once they have them in their retail locations or on their sites. The latest medical breakthrough hasn’t gotten much press, but it’s changing medicine even as we speak. It’s the dawning realization that healthcare is not about how many patients you can see, how many tests and procedures you can order, or how much you can charge for these things. The breakthrough is the understanding that healthcare is a value proposition, which means getting patients the right care, at the right time, in the right place. It’s a matter of focusing on outcomes and cost, so that more Americans will start getting what they pay for in healthcare dollars. Value-based care focuses on two targets: outcomes and cost. Until recently, providers pursued these goals separately, with doctors concentrating on outcomes and the administrators trying to control costs. Value-based care does something different. It works to bring these targets into alignment. The caregivers in a value-based provider work with cost-experts as a team to simultaneously improve outcomes and lower expenses. Doctors, hospitals and payers are partners in the move to value-based care. The Affordable Care Act includes incentives for providers to improve outcomes and lower costs. But this is one breakthrough that will take time for implementation nationwide. Providers who make the transition early will be rewarded with more satisfied patients, lower expenses and pride in a job well done. According to AAMC, the language in the final rule requires that the order to admit a patient be written by a practitioner “who has admitting privileges at the hospital,” something that few residents have as they are not considered members of the hospital’s medical staff. AAMC said it brought the issue to CMS’s attention during an Open Door Forum call Aug. 15. The agency acknowledged it did not intend to prohibit residents from admitting patients, and said it would be issuing a Q&A. However, AAMC said until the issue can be resolved “to the satisfaction of the teaching hospital community,” CMS should make clear to all contractors that no inpatient admission should be denied because it was ordered by a resident while under the supervision of an attending physician. AAMC said CMS should delay enforcing the new requirements for at least six months following the release of the guidance so hospitals will have sufficient time to understand the rules, educate physicians and others, and ensure that they have put in place the mechanisms that are needed to comply with the new requirements. “As short inpatient stays have been a focus of audits by [Recovery Audit Contractors], hospitals feel especially at risk for failure to properly implement CMS requirements,” AAMC said. The letter is available at http://op.bna.com/hl.nsf/r?Open=nwel-9auqls.